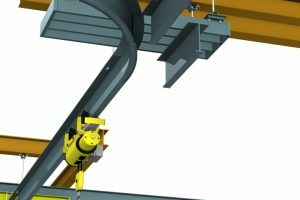 In terms of overhead crane systems tracks are the highways of the lift. In a lifting solution, the rolling surface of the track – the portion where the trolley wheels roll and move, determines the smoothness of the lateral movements. There are many other factors to consider when choosing a track for a lifting system and there are a variety of tracks available each suited to the budgets and the environment of the lift. Choosing which is right for your operation is critical to the long-term use of the lifting system and is balanced against the cost of the system. To clarify, if any beam or enclosure is used as part of a lifting system with a rolling surface, then in our industry, it’s called a track (even though beams can be used for this purpose). This is one of many aspects of a lift that Acculift, after consulting with you and after site inspections, considers when designing a lifting system for you. Sometimes called an I-Beam, due to its signature shape, they are also known as H-Beams, W-Beams, and S-beams dependent on variations in design (typically, standard I-Beams aren’t used in lifting systems but since it is what most people think of when the term beam is used we’ll start there). Beams come in a variety of shapes and sizes for different purposes as explained below but all have standard elements. 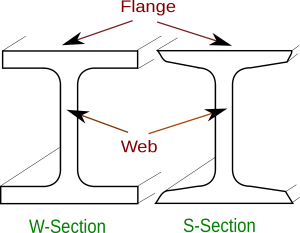 The vertical element, “the web”, resists shear forces while the horizontal flanges (the tops and bottoms of the “I”) resists bending of the beam and are where lifting puts the most force on the beam. I-Beams are usually used as structural components of buildings and, due to their mass production and affordability, were re-purposed as tracks in lifting systems. W-Beams have wider flange surfaces than I-Beams and have parallel flanges of constant thicknesses. The wider flange of a W-Beam has the necessary room needed by the trolley wheels. Again, there are a wide variety of thicknesses, widths, and weight of beams for many different purposes and proper selection and installation is critical to meeting engineering structural standards in a lift system. S-Beams have a slope on the inner flange that gives the beam increased strength and durability (the S comes from the design of the inner surfaces of the flange). They have a higher wheel loading capability than I or W shapes but are more costly. 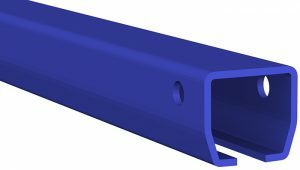 This type of track (also a beam type track) has a hardened lower flange which extends the life of the system, significantly increases lifting capacity and allows for easy movement in push/pull applications. Patented tracks are used when curves, switches (where two crane systems meet), or transfer bridges, are required in the lifting system. They can connect to other monorails and bridge cranes and are great when material must be moved throughout different areas in a facility. Patented track doesn’t wear as easily, so transition points in the system remain smoother, longer and the system has an overall longer lifespan. 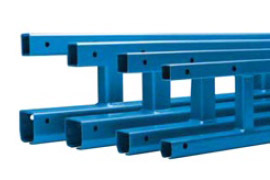 With a lifting capacity of 250 – 4000 lbs this type track is used where there are frequent support points available or where maximum headroom is required. Enclosed track is quite different than beams as the rolling surface is on the inside. The tube-like enclosure virtually eliminates dust and dirt from accumulating on the rolling surface. This prevents wear on the trolley wheels and provides a very smooth, resistance-free, rolling surface for a very long time. Enclosed tracks can be used in a monorail or free-standing systems. They can be manufactured for straight or curved installs and they come in aluminum, steel, or stainless steel. Enclosed tracks are typically lighter than beams with the same lift capacity and are easier to re-positioned if required. Fall arrest systems will use enclosed track for these reasons and it can be added onto other existing track systems relatively easily. The slight downward angle (two degrees) of the rolling surface of the track pushes debris out of the track by the trolley wheels. This keeps the track clean AND extends the life of the trolleys. Enclosed track is best for environments demanding precision movements or that have pollutants in the air. Typically, enclosed track is a modular design requiring no welding. The wheels of the trolley can affect the smoothness of the crane and are the parts most susceptible to wear and replacement so having an enclosed system extends their operating life and keeps maintenance costs down in the long run. On long installations, the track joints are seamless as possible preventing wear on trolley parts. There is a maximum length of the track, due to the length of shipping containers and ground transportation, so joints are unavoidable for some crane systems. This type of track allows for longer spans where support points aren’t available giving more flexibility in crane layout. Trussed track uses the plain steel enclosed track but is enhanced via a built-up truss design. Longer spans translates into fewer runway support points, longer bridge lenghts, and free-standing capabilities. From 20′ – 30′ with a lifting capacity of 250 – 4000 lbs. This type of track is used where lower bridge weight and easier movement are required. With a weight of up to 44% less than steel track, this type of track is easier to move and increases ergonomic worker safety as a result. As the track is taking up less weight of the overall load, the actual load can be heavier. 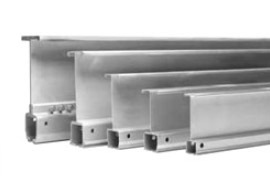 Runway spans from 20 feet and bridge spans of 24 feet with lifting capacities of between 150 – 2000 lbs meet a wide range of applications. The length of workstation cranes can be extended with splice joints for both steel and aluminium track. A splice joint is used to join track sections together and enable the installer to quickly align the joined sections of track. Adjusting bolts on the splice joint help level and align the tracks. Slightly different, aluminium track is extruded with alignment slots and precision ground pins that accurate align runway sections and provide a smooth transition for wheels over the joint. Clamp fasteners attach to the vertical web of the aluminium track to pull and keep the track together. Want to see various track solutions in action? We can show you!